Typical objects found with uncanny regularity across homes, trace the strands of the narrative that runs through the idea of home in India. It is a space that belongs to the familial collective rather than to the individual and therefore carries the responsibility of representing the family to the larger collective. As soon as he walks in, the visitor is sure to run into the great Indian ‘showcase.’ It is a glass fronted cabinet which typically contains trophies and medals won by the children, toys evoking memories of their childhood, wedding pictures, fifty year old pictures of parents in the early years of their marriage and sundry objects that represent the bricolage of the family’s pride & joy. The home belongs to the familial collective and everyone & everything contained in that space is jealously guarded. Guarding against the evil eye and ushering in prosperity is a theme that underlines the divide between ‘insiders’ and ‘outsiders.’ Feng shui Buddha and the Ganesha will sit on the same shelf, united in their endeavour of securing the auspiciousness of the home space. 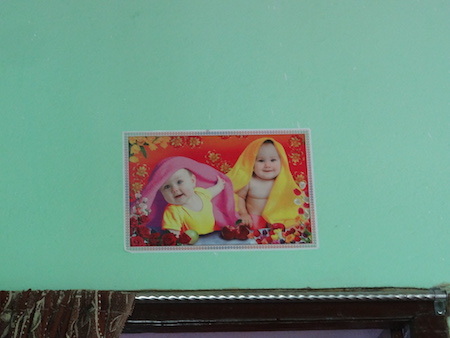 There are some decidedly intriguing objects like soft toys, artificial flowers, posters of babies and ingenuous ways to install covers on all kinds of objects that mark Indian homes. What do these things mean? Why are medieval locks sitting alongside modern security measures? Why do plastic chairs find favour in rural homes as well as in modern urban homes? The shift in identity from the familial collective to that of nascent individuality has heralded the idea of décor; but the unique collection of objects still makes it an unmistakably Indian home. You are currently browsing the Semionaut blog archives for February, 2016.